he Virgin and Child with St Anne is an oil painting by Leonardo da Vinci depicting St. Anne, her daughter the Virgin Mary and the infant Jesus. Christ is shown grappling with a sacrificial lamb symbolising his Passion whilst the Virgin tries to restrain him. The painting was commissioned as the high altarpiece for the Church of Santissima Annunziata in Florence and its theme had long preoccupied Leonardo. In 1498, Leonardo probed into incorporating these figures together by drawing the Burlington House Cartoon (National Gallery, London), which included all three figures in addition to an infant St John the Baptist. An earlier cartoon exhibited in Santissima Annunziata in 1501 is now lost. Ultimately, this painting would emerge during the later years of his life, when he was occupied with an interest in mathematics and other pursuits, its rocky landscape betraying his interest in geology. The demands of his other interests may have forced him to leave this painting incomplete. In addition to the symbolism of Christ playing with the lamb discussed above, Fra Pietro da Novellara, a Vice General of the Carmelite Order, saw a further layer of symbolic significance to the painting. He believed that St Anne's serene expression, in contrast with Mary's anxiety for her child, "perhaps stands for the Church that does not want to have the Passion of Christ prevented". 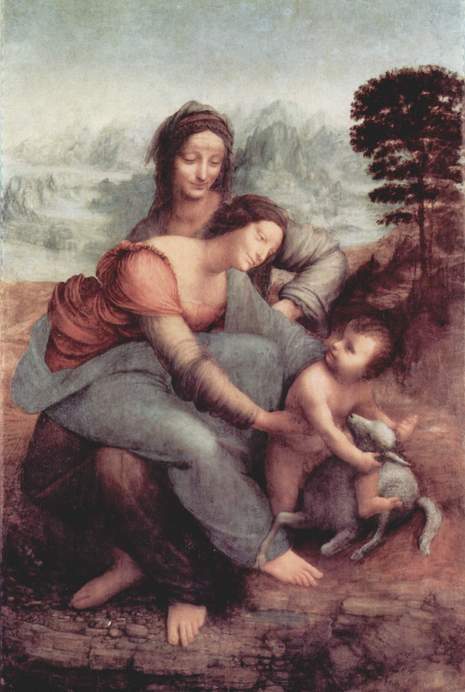 The painting's pyramidal structure influenced Raphael and Andrea del Sarto. Its composition inspired two High Renaissance sculptures, one by Andrea Sansovino (S. Agostino, Rome) and another, less successful work by Francesco da Sangallo (Orsanmichele, Florence). 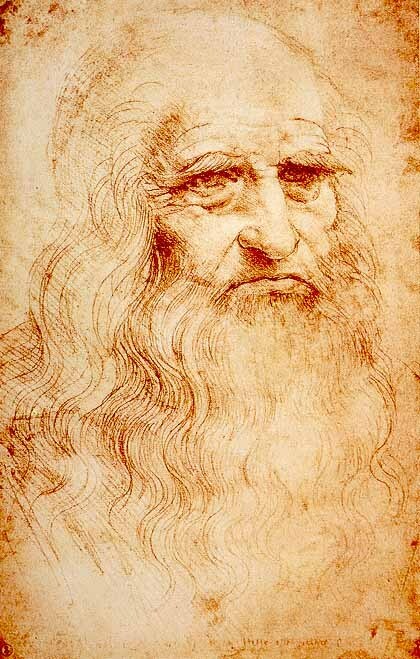 He was an artist long before he was a scientist; in fact it was not until about 1483, when he was over thirty, that he began to ask questions and make notes of the answers. But in his earliest drawings his mind is already at work on one of the problems which were to occupy him throughout his life, what I may call the problem of pentup energy. It appears first in a series of enchanting studies, rapid and apparently spontaneous, of a mother with a child on her knee, struggling with a cat. All three pull in different directions yet all are combined within a simple form, so that the group could be modelled and turned round like a piece of sculpture. There, in relatively simple terms, is one germ of the St Anne. What about the other, her inward turning smile? 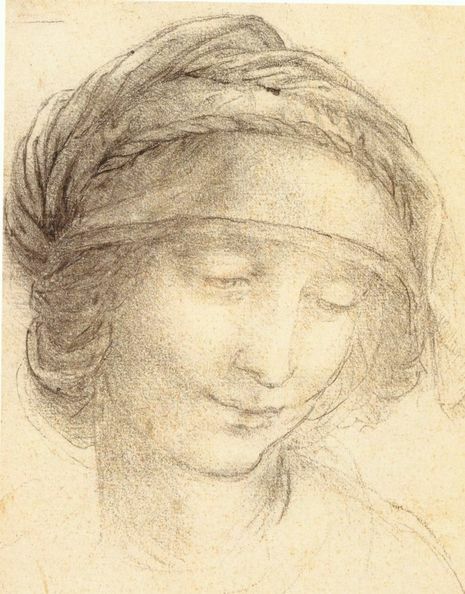 That, too, one can find in Leonardo's early work, and most significantly in the first figure which seems to come from the depths of his imagination, the angel in the Louvre Virgin of the Rocks. That angel is quite different from the obedient, decorative angels of the fifteenth-century. It knows a secret and this has made it smile, gently, almost humanly compared with the St Anne, but with the same air of complicity. And this kinship reminds me that Leonardo, like Blake, developed peculiar ideas about angels, seeing them not as guardians, but as intermediaries who, in order to warn man that his reason is finite, stand at his elbow and propound unanswerable riddles.